I don’t know about you, but sometimes stuffed peppers are a little overbearing because, well, there’s so much of that pepper to eat! I’ve found that I prefer mini sweet peppers (also called baby bell) for stuffing because the skins are thinner so the filling shines. Kids might also prefer them for the same reason – plus, they’re generally easier to eat and little foods are just plain fun! Don’t forget to have that brown rice cooking first! I love brown rice, but I always seem to forget that it takes so much longer to cook! So before you do anything else, get that going or have it pre-cooked. It’s such a bummer if you have to wait on rice to cook! The most difficult part of this recipe is probably just cutting and preparing the peppers. 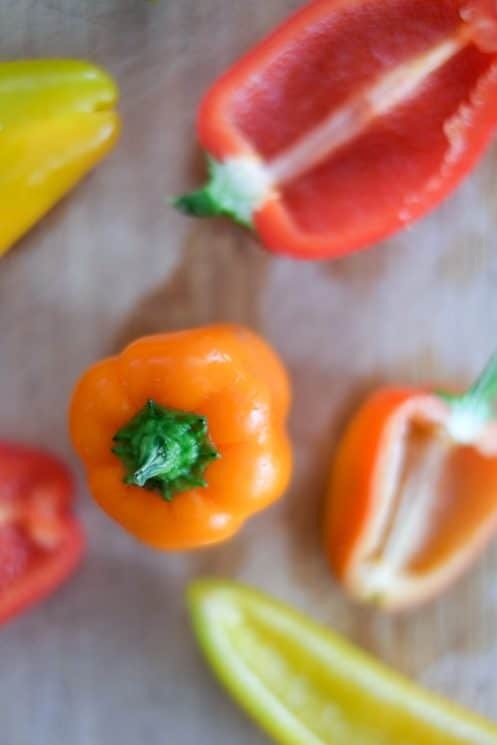 The process is simple but there are just lots of mini peppers to prep! Start by cutting the peppers in half length-wise, then remove any seeds or excess sinew. Set aside for stuffing later. Now just a bit more chopping – get that spinach cut up nice and small. 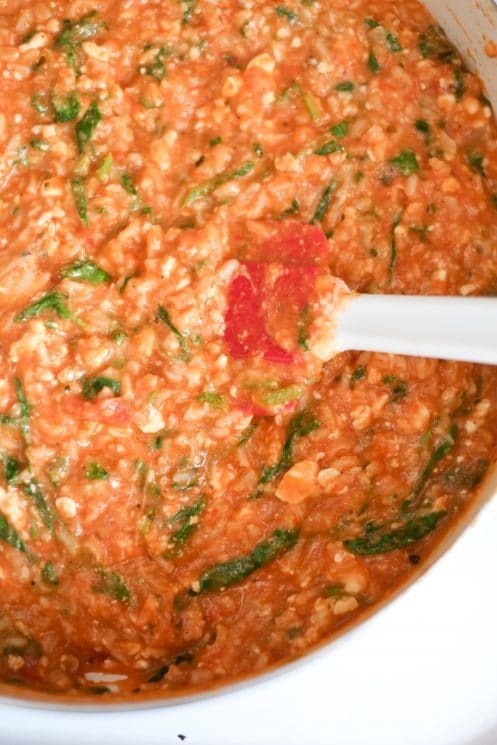 In a large skillet, add the rice, spinach, marinara sauce, cottage cheese, spices, and S+P. Heat on medium high and allow this to simmer for a few minutes, or until the spinach is melted. Add 1/2 cup mozzarella and 1/4 cup parmesan and stir until melted and combined. Now’s the fun part. 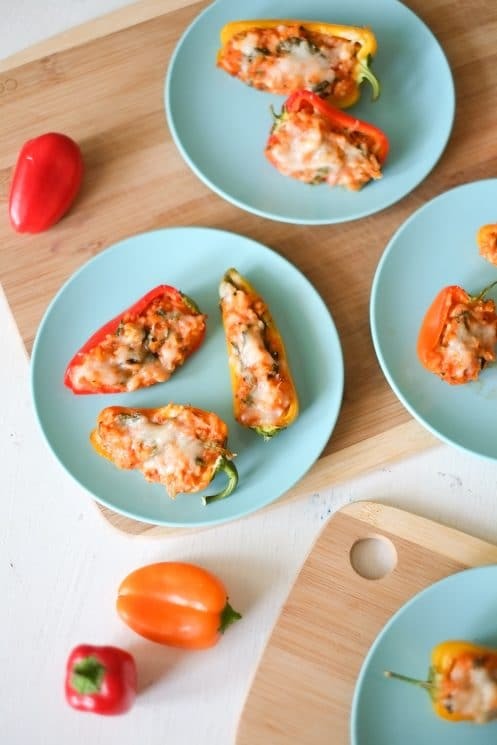 Using a small spoon, scoop up the rice-spinach mixture and carefully plop it into the mini pepper boats. Place these onto a baking sheet lined with foil. Once they’re all filled, top with a little more mozzarella cheese – I used a bit more than 1/4 cup. 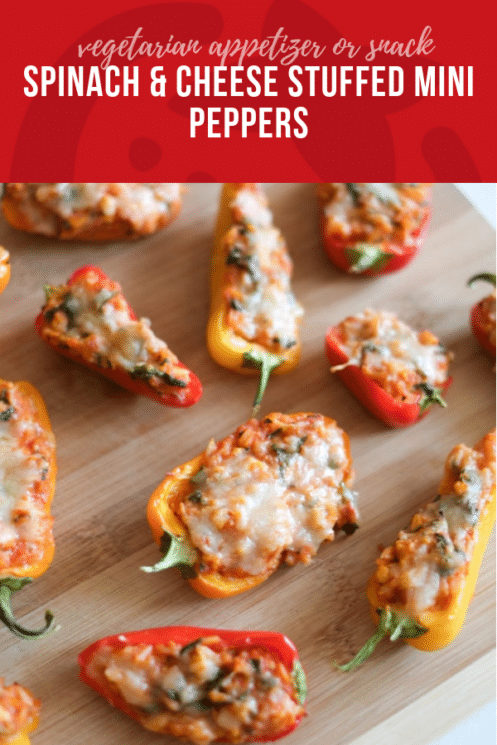 Slide these babies into a pre-heated 350* oven for 10 minutes, or until the cheese has become bubbly and the peppers are soft to your liking. If you feel like getting creative, throw in some quinoa in place of the rice, switch up the cheese for goat or cheddar, or throw in some cooked ground turkey. These are very versatile! 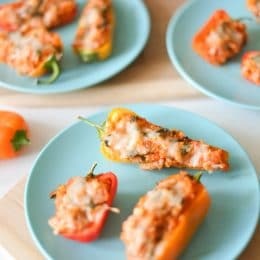 My family loved these peppers and we hope you will too! Cook rice and cut and clean peppers. Preheat oven to 350* F and line a large baking sheet with foil. In a large skillet on medium high heat, combine rice, chopped spinach, marinara sauce, 1/2 cup mozzarella, cottage cheese, parmesan, and seasonings. Simmer for a few minutes, until spinach is wilted and cheese is melted. 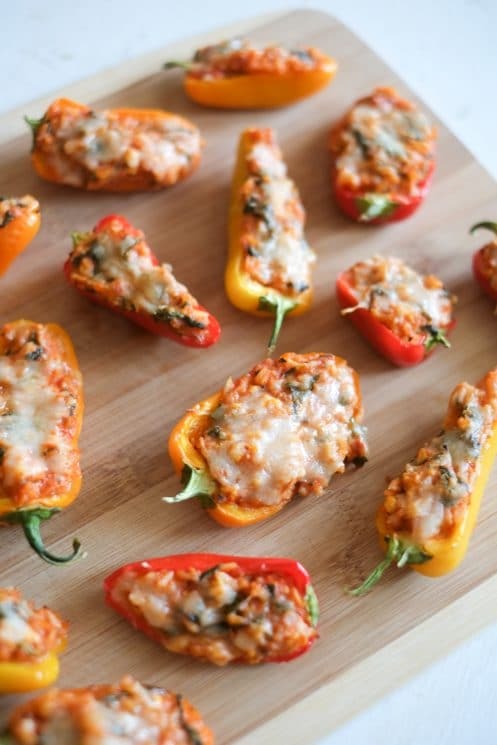 Stuff peppers with rice mixture and then top with pinches of mozzarella cheese (about 1/4 cup total). Place on lined baking sheet. Bake for ten minutes or so, or until cheese is melted and peppers are softened. My family isnt a fan of cottage cheese, what would be a good substitute? How do you think it would be with just mozzarella cheese? Hi Nicole, good question! I know cottage cheese can be a tough one sometimes. You could leave it out and just add a little more tomato sauce and cheese, but I have a few suggestions if you want to keep it: plain Greek yogurt, ricotta cheese, or sour cream. I’ve also heard of people blending up cottage cheese so that it’s not chunky so that their kids will eat it in recipes. I’d love to hear if you find something you love! 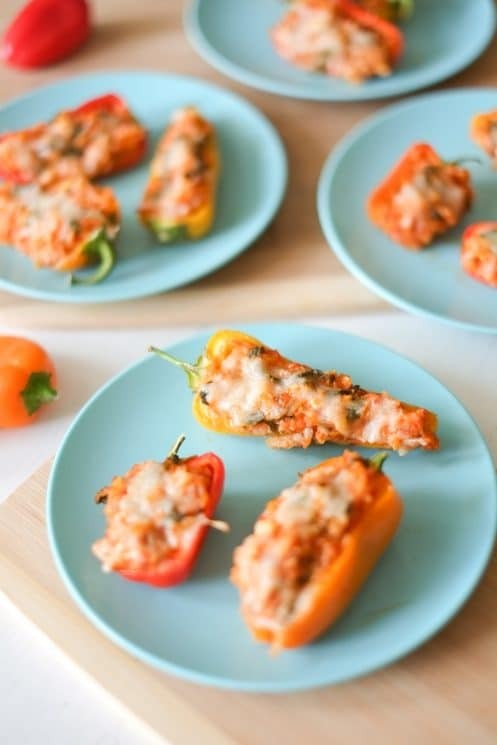 These stuffed peppers are so delicious! I serve them as a side dish when company comes. Easy and pretty too. These sound delicious but would like to use quinoa instead. Do you know how much I should use so the stuffing is the right consistancy?